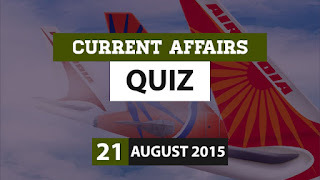 Friends..Here is the Daily Current Affairs Quiz Questions for 21 August 2015. Questions will be very handy for upcoming exams. Brush up your knowledge attempting our quizzes. 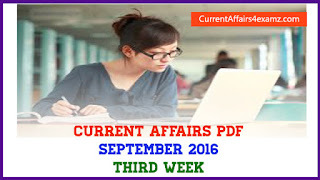 1) Name the web-based portal launched by Government on 20 August 2015 for the students seeking educational loans? 2) Cochin International Airport Ltd in which state has recently become the first airport in the world to fully operate on solar power? 3) ____ has recently become the first country in the world to receive funds from United Nations for its fast growing Solar Home Systems? 4) Who was on 20 August 2015 appointed as Chairman and Managing Director (CMD) of Air India Ltd? 5) Which among the following have been named among the world’s 100 most innovative companies by Forbes? 6) Who among the following has been conferred with Maharashtra Bhushan Award 2015? 7) Zia Haider Rahman who recently won James Tait Black award 2015, UK’s oldest literary prize for his first novel, In the Light of What We Know, belongs to which country? 8) Which country has recently won the maiden Under-16 South Asian Football Federation (SAFF) championship title 2015? 9) Sebastian Coe, who has been elected as President of International Association of Athletics Federations (IAAF) on 19 August 2015 belongs to which country? 10) Actor Paravoor Bharathan who passed away on 19 August 2015 was famous in which film industry?